Tara and an unconscious Glenn ride in the back of a flatbed with the redheaded redneck from the end of last week’s episode. She remarks that he looks like he thoroughly enjoyed killing the zombie. Creep alert! Rick is still pretty busted up but seems to be breathing more normally. Michonne and Carl bond over a milkless breakfast. The mood dissipates quickly when there is a brief mention of Judith. (Guys, stop freaking out! She’s alive!) Rick remarks later to Michonne that it’s great that she can be his best friend because Rick can’t be both Carl’s best friend and dad. Michonne and Carl leave Rick behind to go find supplies. 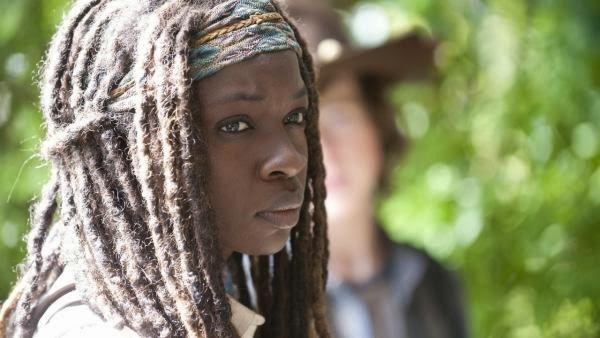 As Michonne and Carl begin to plunder a house, she divulges to Carl that she had a three-year-old son. Carl isn’t being exactly bratty, but he sure is being nosy. At some point Glenn wakes up and Tara tells him that they passed the bus about three hours prior. He freaks out and makes them stop the truck. At this rate, I don’t know how he will ever find Maggie. The three creeps, Sgt. Abraham Ford, Rosita Espinoza, and Dr. Eugene Porter, tell Glenn and Tara that they should join them in the mission to get Eugene up to Washington D.C. instead of going on a wild-goose chase to find a wife that’s probably already dead. A fight ensues between Sgt. Ford and Glenn. As they’re rolling around, a bunch of walkers happen upon Dr. Mullet, so he uses a machine gun to wildly fire everywhere. Whomp, whomp. As Rick lays around useless, a bunch of dudes invade their hideout bickering and fighting. Rick manages to hide under the bed before anyone discovers him. The guys argue about who is going to sleep on the bed. Finally one of the guys passes out on the bed which allows Rick to escape. He hears other guys talking about how there’s a woman shaking up at the house. Rick ends up having to kill one of their companions and manages to sneak out of the house undetected from the remaining creeps. Meanwhile, Glenn walks off from the mullet-madness that’s journeying to DC, but everyone manages to follow him anyway. Rick hovers around the outside of the house when he sees Michonne and Carl wandering up. The other guys are lounging around the house when the guy that Rick killed suddenly turns and starts devouring them. This puts Rick, Michonne, and Carl on the hunt for somewhere new to go. They see a train car with a note that promises: "Sanctuary for All, Community for All. Those Who Arrive Survive." They decide to head on to find the sanctuary. Next week’s episode promises some Daryl action. The next episode of "The Walking Dead," “Still,” airs Sunday on AMC at 9:00 P.M. ET.